Can you believe that this blog has produced 1500 blog posts since its birth on July 16, 2007? 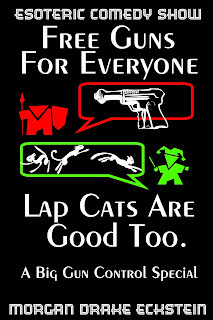 And not all of them have been cat pictures...but maybe they should have been. 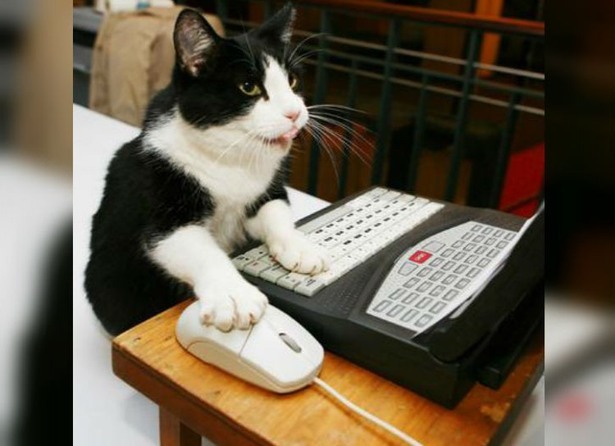 Accountant Kitty has crunched the numbers--you need more cat pictures! One, I am a mealy mouthed poopy head. Two, I like being the center of attention. Three, I assume that you like my sense of humor. 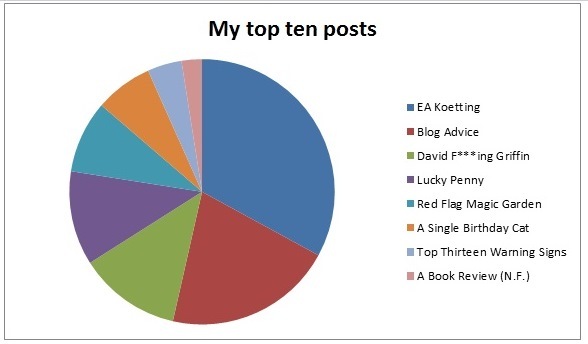 My top ten blog posts account for seven percent of the views that this blog has gotten over the years. E. A. Koetting, the Living God, a single post about his arrest--which I honestly thought would get about a hundred views and no more--is responsible for a whole two percent of this blog's lifetime traffic. 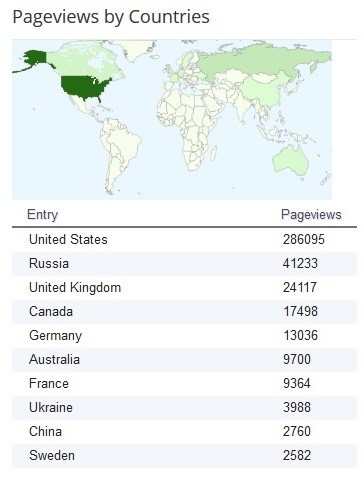 (And a third of my top ten traffic.) Not a month has gone by since it was written that I am not impressed by the traffic it gets. My second most read post is about search engines and Google. This is also another surprise. After all, this blog is not about providing helpful advice to other bloggers. For ease of writing, and making a pie chart--I had to make a pie chart...I like pie charts...I LOVE pie charts--I combined the numbers of the three posts about David F***ing Griffin. He shows up at slot six in my top ten, and takes up three slots...which account for less than one percent of my overall lifetime views for this blog. Now, given the greatness of the man, I expected this number to be higher. Hell, to hear the man talk, all ten of my top ten should be Griffin. Sure he is twelve percent of my top ten, but I expected higher numbers. And yes, I know that I should go though my entire list of blog posts to determine the actual value that Griffin has...but having seen that five other blog posts beat him in the top ten, I don't feel like doing it today. Besides, having watched my traffic on a regular basis, I have noted that Griffin only shows up lately in my keyword search data about three times a month. And no, he does not make it into my top ten search terms for this blog. I know--I am shocked too. My number three top ten is actually a poem--Lucky Penny--but it is actually the picture that drives the traffic to it. The traffic the picture gets is one of the reasons that I eventually decided that most of my blog posts need pictures. Number four on the top ten hit parade is--drum roll please--Red Flag Magic Garden Creeper Award! Again, this was a surprise. Even more surprising is the number of "defenders" who showed up in the comment section telling me that I was completely wrong in awarding a Creeper Award...but realistically it may just be one defender using multiple accounts. And it really does not matter, you can read the screenshots for yourself. Of course, the most amusing part is that the Red Flag post cracked three thousand--and we all know why that amuses me. Number five is a birthday wish to a Golden Dawn authority. Finally, something Golden Dawn shows up. But I am fairly sure that it has nothing to do with Golden Dawn, and has everything to do with the birthday cat picture used in the post. So, we finally get to a post about Griffin--sixth slot--remember I added the numbers of three posts for the purposes of the pie chart. If you dare go look--this is my most popular David F***ing Griffin post. Try not to read anything into that fact. Eight and ten are also Griffin. Number seven is my favorite "Beware of bad behavior by occultists" post. It is not really a surprise that Thirteen Warning Signs That Your Guru is Rotten is in my top ten posts. As long as people insist in posting "Looking for someone to teach me!" messages in Facebook groups, I will continue to share the link to this one. This post is currently expected to fight its way into my top five by the next time, I write about my blog numbers. We know that Griffin is eight and ten, so what is number nine? A bloody book review. How did a book review make its way into my top ten, and perform better than 1491 other posts? Simple, people Google-ing the subject of the book. Turns out that a subject with little information on it will result in long tail effects. ...provided that you are a Virgo. 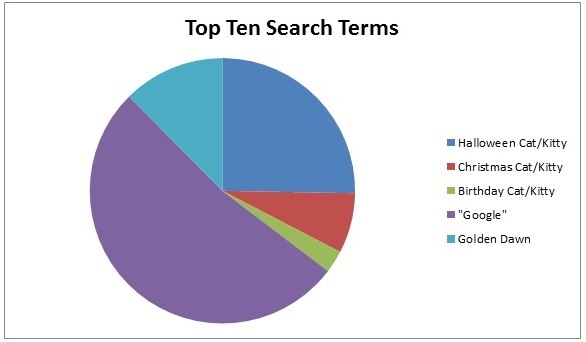 Turns out that my top ten keywords that drive traffic to my blog, eight of them are people looking for cat pictures. Yes, it turns out that more people use Google to find cat pictures than they do to find out stuff about the Golden Dawn. Color me surprised. "Halloween Cat" easily outranked Golden Dawn. For convenience's sake, I combined the misspellings with the proper spellings for the purposes of the pie chart. And it is easy to see that this blog needs more cat pictures. Not only did cat pictures beat Golden Dawn, so did the term "Google." Now, in all fairness, my top ten search keywords only counts for two percent of my lifetime page views on this blog, so there might be tons of stuff in the lower reaches that totally trumps the number of hits that cats and Google gets. On the day that I total up all the Griffin post numbers, I will also total up the views for the cats, and we will have proof who is more popular. I am sad that Australia was not higher in the ranks. 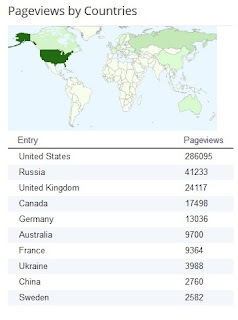 In terms of traffic, ten countries account for eighty-one percent of my traffic. The United States accounts for fifty-seven percent, with number two Russia accounting for eight percent. In my head, Australia is more important than it actually is. Australia, you need to step up your game. Two percent is a poor showing. Australia, you can do better. As for traffic from various platforms, Google accounts for thirteen percent of my traffic; Facebook accounts for four and a half percent. And a single blog has sent me a whole one percent of my traffic (which is not bad at all)--Head For the Red if you are curious. So that is it for my first 1500 posts (eleven f***ing years). Here to the next 1500--of which a whole quarter must be about cats, if I am reading my data correctly.